I was thrilled when my hubby wanted to drink this holiday cocktail as we decorated our Christmas Tree. 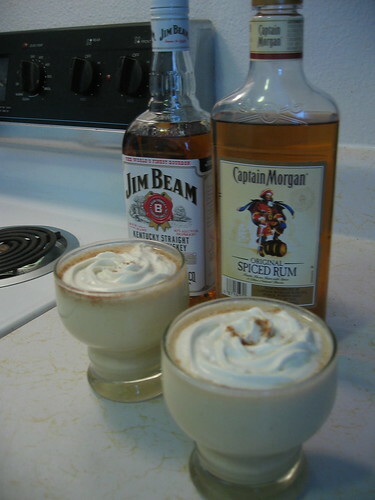 We mixed up Jim Bean, Captain Morgan’s Spicy Rum, Lucerne Egg Nog and Lucerne Dulce de Leche Egg Nog. I liked to count to 6 on my pours of the Jim Bean and the Captain. The hubby likes to measure out his shots with a shot glass. To each one’s own. Then we added whipped cream and nutmeg on top of the cocktail. It taste rich and sweet. It’s the perfect drink for the season. Making Egg Nog from Kris Vera-Phillips on Vimeo. And yes, I know that gray hoodie makes me look like a bum. I just got off work and I was thinking about my on-camera apperance. Grrr. if you think THAT’s tasty–homemade eggnog is unrivaled!